Click the button below to add the Handmade Natural Leather Indoor Slippers | "Tiger Kinga" to your wish list. Wonderfully soft designs with upper material made from vegetable tanned leather and a coated felt sole, which is especially slip resistant – these are the special POLOLOs for kindergarten children. These soft-soled shoes are designed to fit like a second skin that encloses your child's foot, providing warmth and protection. This type of shoe is the best alternative to healthy barefoot walking and is excellent for both pre-walkers and toddlers alike. As in barefoot walking, the musculature is trained and strengthened in a variety of ways, and strong musculature is important for developing healthy and robust feet. Please note that soles made from 100% natural leather may become slippery on hard surfaces, especially if they get wet or dirty. A hard brush can help the soles become raw again. These shoes are intended for indoor use. Children's feet are not like small adult feet- instead, they consist primarily of cartilage and are therefore much softer and more flexible. Even the smallest amount of pressure, which can be triggered by ill-fitting or too hard shoes, or too little room for movement, can affect the development of a child's feet. Pololo shoes are very soft and provide little feet with just the freedom of movement they need for healthy development. To find the right size, please see the size chart below. Materials: 100% natural leather (vegetable tanned, soft, and chrome free), silicon-coated felt sole. 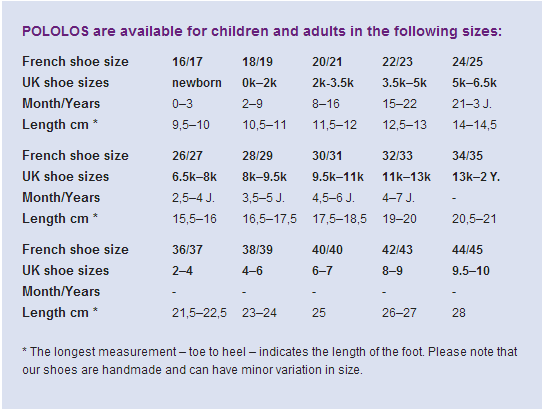 Sizing: Length in cm in the size chart below is based on the measurement of your child's foot, from heel to toe. An easy way to measure your child's foot is to have your child stand flat on a piece of paper and mark the measurements from heel to the end of the biggest toe. Use the foot measurement in cm to find the corresponding European (French) shoe size (there is usually no need to add extra room or size up, as the corresponding shoe size itself already accommodates a bit of extra room).